We provide some of the best deals for Pushkar by India Train. Pushkar is a well known city in India famous for its pilgrimage's place in Rajasthan, and it is told that Pushkar is one of the place where Lord Brahma Temple is situated. We help you discover such a sacred city alone with other temples and forts which speaks its stories itself about the culture and lifestyle of people there in Pushkar. Duration : 6Nights - 7Days with Hotels & travel by Air Conditioned Train & Car with Personal Driver For the below trip. Namaste! Today you will arrive at the Indira Gandhi International Airport in New Delhi. A Friends Travel Services representative will be waiting for you with a sign bearing your name and you will then be transferred to your hotel. Rest of the day is at your leisure. Stay overnight at the hotel in Delhi. (In case of any difficulty Call us on our 24 x 7 No. +91 9818243600). This morning after breakfast first you will visit old Delhi. The Raj Ghat, Red fort & Jama Masjid Chandni chowk spice market largest spice market by Afternoon proceed to visit the New Delhi . The Qutub Minar, tallest stone tower in India , imposing India Gate and the Rastrapathi Bhawan, Laxmi Narayan Temple , Lotus Temple and, newly built Akshardham temple are of much significance. By evening return to your hotel for overnight stay. This morning after breakfast you will be transferred to New Delhi railway station to board the train to Agra. On arrival at Agra railways station, our representative will meet you to pick you up and transfer to your hotel. This afternoon you will visit the Agra fort, built by the great Emperor Akbar, and the famous Taj Mahal-the symbol of love, built by Emperor Shah Jahan in memory of his wife Mumtaz Mahal. By evening return to your hotel for overnight stay. In case you visit the Taj Mahal at Sunrise, same can be arranged in the trip for next morning. This morning after breakfast excursion to Fatehpur Sikri, the deserted red sandstone city built by the Mughal Emperor Akbar. Visit the Palace Complex, Buland Darwaja and the Dargah of Sheikh Salim Chisti. This afternoon Return to Agra and transfer to Agra Railway Station to board the train to Jaipur. On arrival at Jaipur railways station, our representative will meet you to pick you up and transfer to your hotel. Stay overnight at hotel in Jaipur. This morning after breakfast visit the Amer fort, built in 16th century, enjoy the Elephant Ride at Amer. Drive past the Hawa Mahal-a Palace of winds. In the afternoon you will visit the city palace and museum, walk to adjacent Jantar Mantar an astronomical observatory. By evening return to your hotel. Stay overnight at hotel in Jaipur. This morning you will be transferred to Jaipur railway station to board the train to Ajmer. On arrival at Ajmer railways station, our representative will meet you and transfer you to Pushkar at your hotel.Afternoon you may visit pushkar lake Or rest in the hotel.overnight in Pushkar. 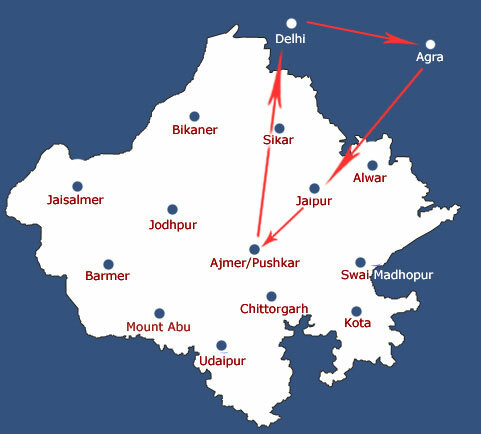 Day 7 : Pushkar to Ajmer by car Ajmer to Delhi by Train in Delhi Transfer to Delhi Airport OR Hotel in Delhi This morning after breakfast you will visit Pushkar a town in the Aimer district in the state of Rajasthan , India . It is situated at 14 km North West from Aimer at an a verage elevation of 510 meters (1673 feet), and is one of the five sacred dhams (pilgrimage sites for devout Hindus). It is often called “Tirth Raj”- the king of pilgrimage sites- and has in recent years become a popular destination for foreign tourist. Pushkar is one of the oldest cities of India . Pushkar lies on the Shore of Pushkar Lake. The date of its actual origin is not known, but legend associates Lord Brahma with its creation. It is mentioned that Brahma performed penance here for 60,000 years to have a glimpse of Vishnu. Places to visit BRAMHA TAMPLE Jagatpita Brahma Mandir are a Hindu temple situated at pushkar in the Indian state of Rajasthan, close to the sacred Pushkar Lake to which its legend has an indelible link. Pushkar fair held each November at the time of the kartik purnima full moon, Pushkar clam fair is one of India Most highly rated travel experience a spectacle on an epic scale attracting 300,000 people and up to 20,000 camels, cattle and horses. For visitors it is a once in a lifetime opportunity to witness the colour pectacle and carnival of one of the last great traditional meals.Finely in the afternoon proceed to Ajmer railway station to board train to Delhi.oupon arrival in delhi our representative will meet you and transfer you to Hotel in delhi.Overnight in Delhi OR transfer to Airport for onwards Flight. 06 Nights accommodation in Tourist class hotels with private bathroom & breakfast on twin sharing basis. The rooms are normal European style rooms with nice soft bed. All arrival, departure, sightseeing's as per above itinerary by Air-condition tourist car in Delhi, Agra, Jaipur, Ajmer, Pushkar As per the above tour. Train Tickets Delhi, Agra, Jaipur, Ajmer Delhi by Air-Condition class trains. Any meals other than those specified. Any other item not specified. We also offer customized tour to our customers. The customized tour is exactly what you want. PLANNING A HOLIDAY IN INDIA CONTACT US FOR A NON OBLIGATORY QUOTE. Copyright @ India Tour Package. all rights reserved.